Preparing your home appliances for the move is a huge step which shouldn’t be underestimated. Pre-move tasks are an essential part of every successful move. Failing to do some basic preparations for the moving day may result in making some disastrous moving mistakes that could have been easily avoided in the first place. Your washing machine as well as other appliances need to be properly prepared for the moving day. Hopefully the following tips will help you move your washing machine without any troubles. – Consult the manufacturer’s manual which usually provides helpful guidelines in case of moving. If you haven’t saved the manual, try to find it online. Knowing the exact model of a washing machine will help you find the specification on the internet. – Clean the inside and the outside of the washing machine. Start a normal washing cycle and afterwards leave the door open for a while so that washer can dry. Drain the water from your washing machine. – Disconnect the washing machine from the water supply. Turn off the water outlets. – Turn off the power and unplug the washer. – Disconnect the hoses from the valves and from the washing machine and keep them with the washing machine. – Remove the drain hose and secure it upright to the washer. – Pay attention while disconnecting the washer so that you can reassemble each part easily once you reach your new home. You can even take notes, if necessary. – In order to keep each part where it belongs, make sure to install washer locks. – Secure all cables with the tape so that they don’t get lost while in transit. – Tape the lid so as to keep it closed during the move. – Use original packaging if you have saved it. If not, find the best way to secure the appliance on the big day. – Keep scratches away by wrapping the washing machine with moving blankets, paper padding and other protective material available at the moment. – Have some friends help you with the move. If the professional movers are assisting, you can rest assured that the job will be done smoothly. But if you decide to move yourself, get friends’ help. – Be careful while loading and unloading the washer. Mind lifting techniques. You can move heavy appliances like fridge or washing machine without getting your back injured. Your safety should be a top priority on the moving day, so remember to lift heavy objects with your leg muscles, and not with your back. Instead of carrying the load all along, use a dolly. If you are moving the washer up and down stairs do it slowly with the assistance of a friend, of course. – Keep the washing machine standing upright during the relocation process. It is not recommended to move a washing machine on its side, since there’s a possibility the drum can get off balance. If you have any doubts, contact your NYC moving company to ask for further instructions. They have a lot of experience and will advise you as to how to protect your washer properly throughout the moving process. – Once you put the washing machine inside the moving truck, make sure it is secured with ropes and straps. – Do not load too heavy items on top of the washing machine, because they can damage it. 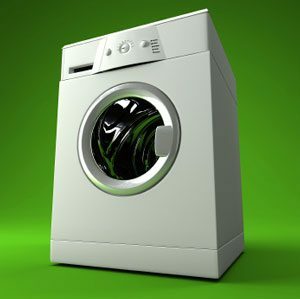 – Once you plug in the washer in your new home keep an eye on it when you are using it for the first time so that you can be prepared to act quickly in case of some leaking.